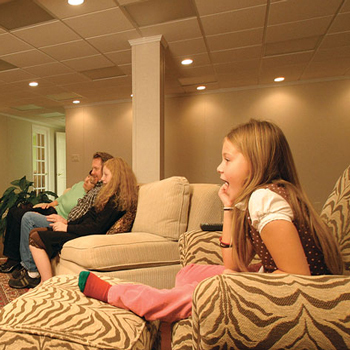 A popular use for basements are media rooms. This one is like a mini-theater with second row seats raised for a better view of the screen. While a basement could be used for anything that a normal area of the house could be used for, it can be the best area for certain types of rooms. When coming up with a basement finishing plan or basement designs, bear in mind that this below-grade space provides a uniquely quiet, private space with the unique feel that makes it perfect as a separate area in the home. The questions are, what to use it for, and how to layout the space. Here's an article on laying out a basement: Basement Layout: What Goes Where. 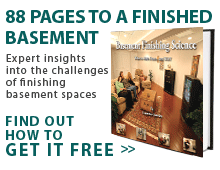 Total Basement Finishing dealers offer Free Basement Design Consultations and Quotes. For a helping hand with your basement remodeling & basement design ideas, call or contact us online and we'll be glad to offer our expertise. If you're finishing the basement and are looking for some great basement remodeling & basement design ideas to help you decide what to do with that extra space in your home. 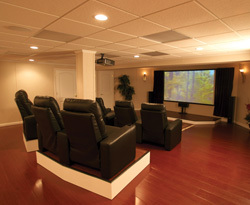 A home theater enhances the viewing and listening experience of everything from PBS to the WWE and there is no better place for it than a converted basement. Basement bedrooms are private, quiet, relatively easy to heat and cool and the most cost-effective way to add an extra bedroom to your home. Finishing your basement to create an in-law apartment gives you the opportunity to incorporate special details that will enhance your family's comfort, security and closeness. In a tough economy, income from a basement apartment can help with household expenses in a big way. If the man of the house needs a place to play cards or watch sports with his pals, a basement man cave may be the answer. Entertaining around a basement bar is a great way to hang with friends. Add a pool table and dart board and the local pub will be wondering where its customers went. Installing a home office in the basement is a great way to have a quiet, tucked-away workspace in the home. Because the basement naturally feels like a different space than the rest of the home, you can work in the house without feeling like work and home are one and the same. A basement home office provides a great space to work, use as a creative space, or use as a productive "office away from the office" when you need a change of scene. Installing a personal gym in your basement is a great way to keep in shape from the privacy of your own home. With a basement gym, you can exercise completely on your own schedule without the need to fight for parking or waiting to use equipment. 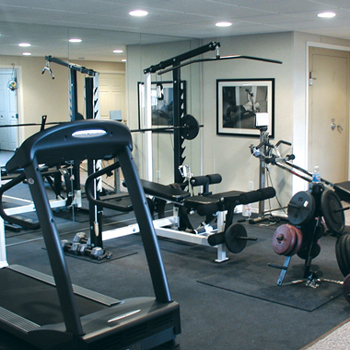 Installing a basement gym will create a convenient environment for a healthier, happier you. A remodeled basement can make a great area for a comfortable private in-law apartment or guest area for the home. 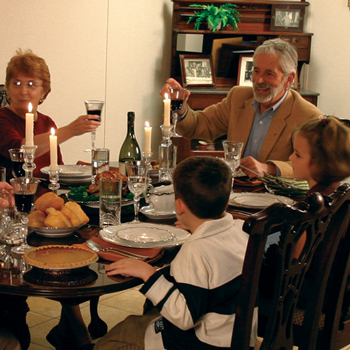 Naturally separated from the rest of the house, a basement in-law suite allows for a layout that can allow the guests or live-in family members to relax as if in their own home. The area can easily be designed with its own basement bathroom, bedrooms and a living area where they can relax and feel at home. 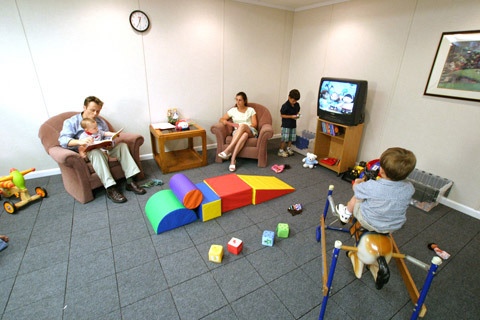 Creating a children's play room with Total Basement Finishing's line of warm, durable materials is an ideal choice! For toddlers and infants, our finished basement flooring is ten degrees warmer than the cold concrete underneath, meaning that they will have a nice warm surface for their hands and knees. EverLast™ wall panels are much more durable than drywall and easier to clean than paper or cloth-surfaced materials. They will stay beautiful for decades!